2000 McCoy Nugget 6 ft 11 1/2"
Fibreglassed foam blank, 3/8" plywood stringer, spray, r/h plug. 1. Four colour/black oval on nose. 2. Orange/black Geoff McCoy Designs script at sweet spot. See right. 1. Orange/black Geoff McCoy Designs script at nose.See right. 2. Four colour/black oval, forward of centre. 3. Four colour/black oval Loaded Dome/Designs to Free Your Mind, forward of fins.See right. Deck: Sprayed : two yellow stripes, black pinlines, light blue rail panels. Bottom: Sprayed yellow stripe, two red (front) half rail panels, black checked Vee at centre. Purchased second hand by John McInnes, March 2001. 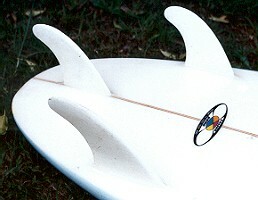 A 1998 Thruster finned adaptation of the company's Lazor Zap - a no-nose, wide tailed single fin board designed by Geoff McCoy and Cheyne Horan, 1979-1984. Initially treated with scepticism by the surf press, this design was in response the increasing popularity of Mini-mal templates that retained traditional Malibu board lines. With an emphasis on ease of paddling and stablity when riding, the design is now used by many other manufacturers.